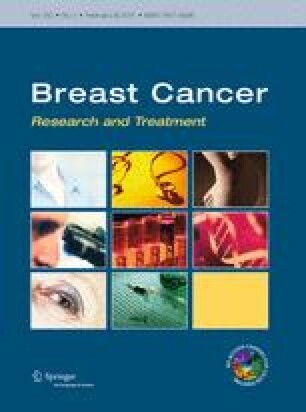 We investigated if associations of breast density and breast cancer differ according to the level of other known breast cancer risk factors, including body mass index (BMI), age at menarche, parity, age at first child’s birth, age at menopause, alcohol consumption, a family history of breast cancer, a history of benign breast disease, and physical activity. This study included 1,044 postmenopausal incident breast cancer cases diagnosed within the Nurses’ Health Study cohort and 1,794 matched controls. Percent breast density, absolute dense, and non-dense areas were measured from digitized film images with computerized techniques. Information on breast cancer risk factors was obtained prospectively from biennial questionnaires. Percent breast density was more strongly associated with breast cancer risk in current postmenopausal hormone users (≥50 vs. 10 %: OR 5.34, 95 % CI 3.36–8.49) as compared to women with past (OR 2.69, 95 % CI 1.32–5.49) or no hormone history (OR 2.57, 95 % CI 1.18–5.60, p-interaction = 0.03). Non-dense area was inversely associated with breast cancer risk in parous women, but not in women without children (p-interaction = 0.03). Associations of density with breast cancer risk did not differ by the levels of BMI, age at menarche, parity, age at first child’s birth, age at menopause, alcohol consumption, a family history of breast cancer, a history of benign breast disease, and physical activity. Women with dense breasts, who currently use menopausal hormone therapy are at a particularly high risk of breast cancer. Most breast cancer risk factors do not modify the association between mammographic breast density and breast cancer risk. The online version of this article (doi: 10.1007/s10549-015-3286-6) contains supplementary material, which is available to authorized users. We would like to thank the participants and staff of the Nurses’ Health Study for their valuable contributions as well as the following state cancer registries for their help: AL, AZ, AR, CA, CO, CT, DE, FL, GA, ID, IL, IN, IA, KY, LA, ME, MD, MA, MI, NE, NH, NJ, NY, NC, ND, OH, OK, OR, PA, RI, SC, TN, TX, VA, WA, WY. The authors assume full responsibility for analyses and interpretation of these data. Financial support was received from Public Health Service Grants CA131332, CA186107, CA087969, CA186107, UM1 from the National Cancer Institute, National Institutes of Health, Department of Health and Human Services, Avon Foundation for Women, Susan G. Komen for the Cure®, and Breast Cancer Research Foundation. Dr. Colditz is supported in part by an American Cancer Society Cissy Hornung Clinical Research Professorship.